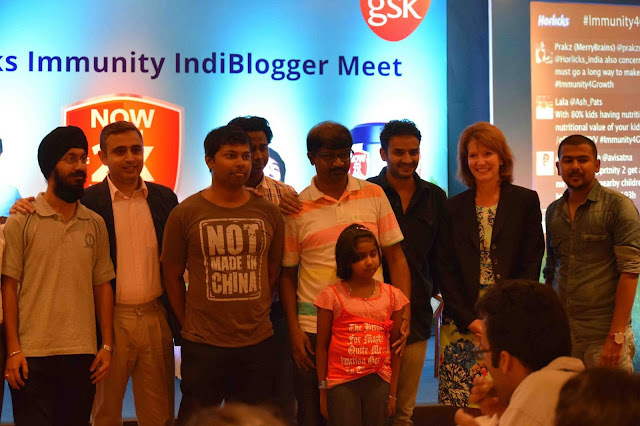 CYNOSURE IS MUSED: Horlicks Indiblogger Meet...!!! A bloggers meet after long time; though few happened, but I was unable to attend them lately due to some prior commitments. When this invite came I was, indeed, really excited. Well, it was really an eventful evening. Firstly it was sunday, then a blogger's meet in Vivanta by Taj clubbed with Mother's Day celebration. Also, the hall was full with chit-chats as parents were allowed to bring kids with them. Also not to mention the Bangalore was back to its beautiful weather, so a bike ride to the event was not at all a problem. First we're welcomed with juices and beverages; only soft drinks (as the event was about health, nutrition and immunity :P ). Well, it was a real fun to have Horlicks after long time. The event started with a usual introduction and a special video and warm welcome for all the mothers on the special occasion of Mother's Day. It was followed by the presentation by Jill Castle. The talk was really insightful with lots of facts which, not even kids, but are important for adults also. In respect to kids, I was able to relate many nutrition problems as I'm living with my 1.5 years old niece. The points she made about the problems of nutrition in India among kids is of pretty grave concern. The second half of the event was followed with product presentation; panel discussion and some Q&A. However, the best part of the event came when there was a small quiz and I, fortunately, happened to be part of the winning team. The team members were really smart, as they had the recording and snapshots of all the slides. Obviously, not to convey the special thanks to Google baba for their help. The event concluded with a some hefty amount of Flipkart gift vouchers for our team. Later it was an awesome dinner when I finally got the chance to meet few bloggers with whom I was in contact with for around 6+ years. At last it was time to collect the goodies and head home. The event was pretty interactive, to the point, short and sweet. The journey back home was again a pleasant ride to home with cold winds blowing.